We offer Hard Anodising using a 10% Sulphuric Acid mix at -5°C to 0°C. Process: Hard anodising is the formation of aluminium oxide on the surface of aluminium, which can be electrochemically produced under controlled conditions to provide thick protective coatings. The process consists of passing an electric current through a refrigerated10% sulphuric acid solution in which the immersed aluminium component acts as the anode, and lead typically provides the cathode. During the process, electrolysis breaks down the water into oxygen and hydrogen. The oxygen combines with the aluminium to produce aluminium oxide. The resultant hard anodised coating has excellent adhesion to the base material and exceptional dielectric strength. Temperature resistance (oxide surface stable upto 2000°C). Thickness: Most requirements for hard anodising are in the 25-50 micron range, but It should be noted that the coating is derived in part from dissolution of the metal surface, so that a 50 microns coating causes an increase in surface level of 25 microns. This must be borne in mind when making allowances for growth: Hard Anodised coatings can be applied in excess 75 microns which, can then facilitate the option for grinding back to tight tolerances required if necessary. 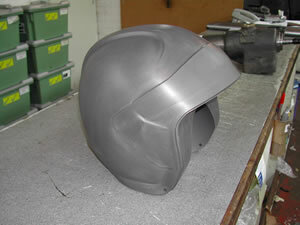 Surface Finish: Hard Anodising in engineering application is normally used in its as-produced colour. This colour is usually a slate grey, but is dependent on the grade of aluminium alloy. The thickness of the Hard Anodised finished surface will increase and needs to be taken into consideration when specifying tolerances at the design stage. Masking: Tapped holes/ small bores can be masked off with special plugs relatively easily. However careful consideration and time has to be given whilst masking off faces and other areas with lacquers. Capacity: We offer tank sizes up to 8’ x 3’ x 4’ which give us the capability to normally offer a fast turn around. Jigging Requirements: Very firm jigging and contact points capable of carrying high current densities are essential in hard anodising, ideally tapped holes. Where the jigs contact the work there will be no anodised coating, and a small mark will result. Naturally, jig marks are kept to an absolute minimum and contact points are usually situated where the lack of anodised film has minimum detrimental effect. The selection of the position of contact points is therefore important and non-significant areas should be marked on drawings. When submitting components to be anodised, it is imperative to consider how it can be jigged. Unless specified on a drawing, or by written or verbal instructions, contact points will be chosen at our discretion.